+++SOLD+++ ONLY 3321 MILES! 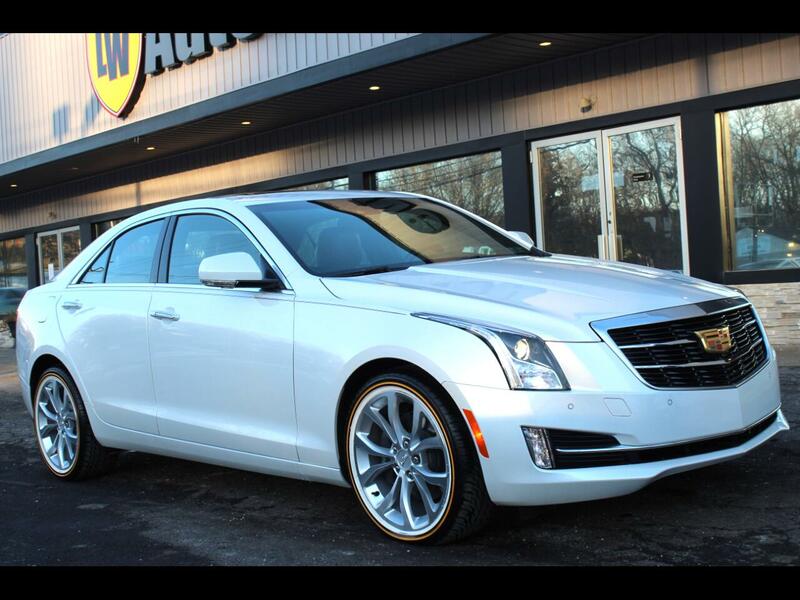 2016 CADILLAC ATS 2.0L PERFORMANCE AWD SEDAN! PERFECT ONE OWNER CLEAN CARFAX! 2.0L TURBOCHARGED ENGINE! FACTORY WARRANTY! VERY SHARP RIDE! PEARL WHITE EXTERIOR WITH CHOCALATE BROWN LEATHER AND BLACK TRIM. 18" SILVER ALLOY WHEELS WITH WHITE WALL VOGUE TIRES. RUNS AND DRIVE PERFECT! STILL HAS THAT NEW CAR SMELL! NEW PA INSPECTION AND EMISSIONS VALID THRU 2/20! THIS CADDY IS HIGHLY OPTIONED WITH; 2.0L L4 TURBOCHARGED ENGINE, AUTOMATIC TRANSMISSION, NAVIGATION, BACKUP CAMERA, COLLISION ALERT, LANE DEPARTURE WARNING, BLIND SPOT ALERT, PUSH TO START, LEATHER INTERIOR, ALL POWER OPTIONS, BOSE SOUND, CADILLAC CUE INFOTAINMENT SYSTEM, SATELLITE RADIO READY, BLUETOOTH, LEATHER WRAPPED STEERING WHEEL W/ CONTROLS, DUAL CLIMATE ZONES, HEATED SEATS, POWER SUNROOF, FACTORY REMOTE STARTER, KEYLESS ENTRY, PROJECTOR HEADLIGHTS, LED MARKER LIGHTS, LED DAYTIME RUNNIING LIGHTS, 18" ALLOY WHEELS AND MORE! 2 KEYS, 4 CARPET FLOOR MATS AND 4 RUBBER FLOOR MATS INCLUDED WITH THIS VEHICLE. THERE IS STILL A BALANCE OF THE FACTORY WARRANTY LEFT ON THIS CADILLAC. AS OF 2/28/19 THERE IS 7 MONTHS OR 46,679 MILES LEFT ON THE BASIC WARRANTY AND 31 MONTHS OR 66,679 MILES LEFT ON THE DRIVETRAIN WARRANTY. PLEASE CLICK THE CARFAX LINK OR CALL US FOR MORE FACTORY WARRANTY INFO. THIS VEHICLE IS LOCATED AT 9234 PERRY HIGHWAY PITTSBURGH 15237, PLEASE CALL 412-366-7400 FOR MORE INFO OR TO SCHEDULE A APPOINTMENT TO SEE THIS VEHICLE. WE DHIP NATIONWIDE! THANKS FOR LOOKING!